Two men from the North West District (NWD) of Guyana were Monday arraigned for separate murders that were linked to arguments. In one of the cases, 23-year old Leonard Fredericks of Heaven Hill, Matthews Ridge was arraigned for allegedly murdering Peter James at Hell Hill, also in Matthews Ridge. Police Prosecutor Simone Payne told the Court that the duo had an argument two months before. On December 30, 2015 James was at a shop imbibing when Fredericks approached him and stabbed him several times about his body. 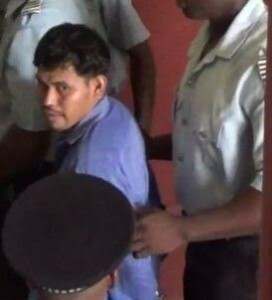 Fredericks was remanded to prison until January 7, 2016 when he would appear before Chief Magistrate, Ann Mc Lennan. In the other case, 28-year old Elvis “Johnny” Felix was charged with the murder of Brian Simon at Itchie Rock on Boxing Day, December 26, 2015. The prosecutor’s case is that Felix chopped Simon to his head and wrist during a misunderstanding. The injured man died while he was being transported to a health centre. Felix was arrested on December 30, 2015 and handed over the murder weapon to police. After the indictable charge was read to him, he was not required to plea and was remanded to prison until January 7, 2015 when he would appear before the Chief Magistrate.